Hello hello! I’ve been having a wonderful and creative few days here at Create Chicago. Taking awesome classes and visiting with pals I’ve met at previous Create retreats here in Chicago. My first day here I took a class from the (in)famous Sue Pelletier. The class was called Create The Dress You Were Meant To Twirl and Spin In. Sue is a mixed media maven extraordinaire and it is absolutely charming to spend the day learning from her. 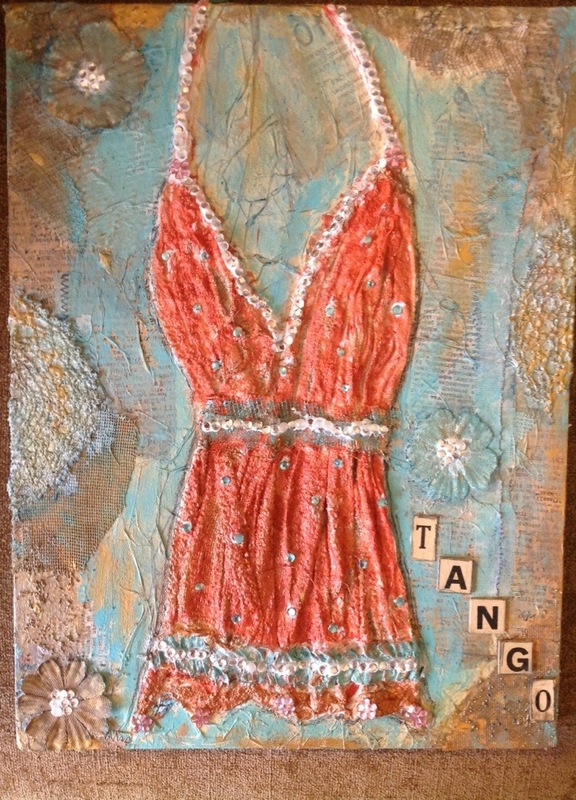 I made my dress a bodacious little tango number in the color my mother would never let me paint my room. I really enjoyed the process and building layers upon layers of paint and lace and ephemera and flowers. I will add a few more finishing touches when I return home tomorrow but for now…..anyone up for a tango??? Haha–ole! Thanks very much for getting in the spirit Pauline! I’m looking forward to getting caught up on my blog reading when I get home! Beautiful! I call this color “mango”, one of my favorites. Great work! It is like mango and it is one of my fav colors too! Thanks for stopping by and commenting! You have creativity that is very very special! thanks very much! Please visit again!